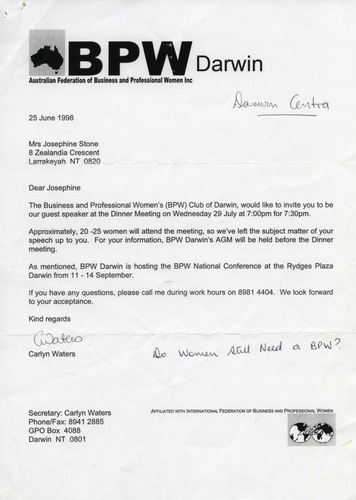 Speech by Mrs Josephine Stone titled 'Do women still need a BPW?' at the Business and Professional Woman's Club Darwin Annual General Meeting dinner held at the Darwin Central Hotel. Josephine Stone spoke regularly at events and functions during her time as the Northern Territory 'First Lady' and since. Josephine was an active and committed participant in philanthropic community activities, most notably the Katherine Red Cross Flood Appeal and in the NT CLP where she was a founding member of Country Liberal Woman. Josephine had also served as a member of the Chief Ministers Advisory Council. Josephine was made an Honorary Life Member of the Country Liberal Party in November 2017 in recognition of her contribution. Josephine was made a Member of the Order of Australia on Queens Birthday 2007. Her citation read: "For service to the community of the Northern Territory, and to the law''. A selection of Josephine Stone's speeches have been saved to this website.